Microcontroller technology has exploded in popularity among ham radio operators. The new generation of single-board microcontrollers is easier than ever to use, bringing together hardware and software for project-building most radio amateurs can easily dive into. With inexpensive microcontroller platforms – such as the popular open-source Arduino board – along with readily available parts, components and accessory boards, the possibilities are limitless: beacon transmitters, keyers, antenna position control, RTTY and digital mode decoders, waterfall displays, and more. 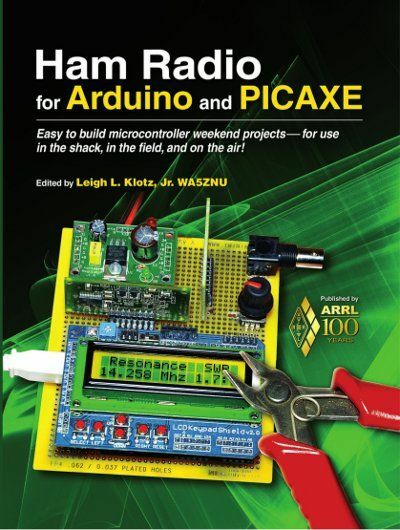 Editor Leigh L. Klotz, Jr, WA5ZNU has assembled this first edition of Ham Radio for Arduino and PICAXE to help introduce you to the rewards of experimenting with microcontrollers. Klotz and many other contributors have designed projects that will enhance your ham radio station and operating capabilities. Or, you can take it to the next step, using these projects as a launch pad for creating your own projects. "The projects here use common, off-the-shelf physical computing parts such as the Arduino, and leverage techniques and expertise from the ham community and the Maker community to make something that both groups can appreciate, use, and extend." — Dale Dougherty, founder of MAKE Magazine and The Maker Faire. Build one of the projects in a weekend, and have something you can use around the shack or in the field. Learn to customize and extend the hardware and the software. Solve real problems yourself, using easy-to-use tools and techniques. Choose among the Arduino, ATTiny, and Picaxe, for your project. Copyright © 2013 American Radio Relay League. All Rights Reserved. Arduino is a registered trademark of The Arduino Team. PICAXE® is a registered trademark licensed by Microchip Technology Inc. to Revolution Education Ltd for exclusive worldwide use. Book cover photo by Alan Biocca W6AKB.